I’ve never titled a post or newsletter with terms like melt the fat! or burn the calories! or get the six-pack! I prioritize the health of my body over aesthetics or athletic performance. Those, I believe, arise as side effects of a healthy body. 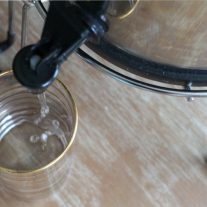 But I thought you would be interested in reading this post… and so that title served it’s purpose! In this discussion infrared saunas, I’ll explain how you can get the equivalent of a 6 mile jog by sitting. Why did I invest in an infrared sauna? An at-home infrared sauna is a significant investment. 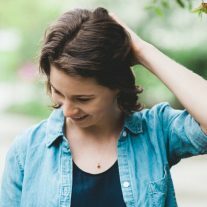 I saved for years, and took that time to research the best options. Also, I consider it valid and appropriate for you to ask if I am promoting a bigger-ticket product because I received it for free. I will always answer that, and my review always reflect my honest opinion. I personally bought the sauna I review here, and it was a heavily-considered investment worth every penny. Sunlighten reached out to me after I had recommended this sauna (without financial gain) in a previous blog post. Now, I am an affiliate for them so I receive a small commission if you purchase through my link. I greatly appreciate your support, because I would not be able to support Empowered Sustenance without the affiliate commissions. Infrared saunas offer more therapeutic benefits than traditional heat saunas. Infrared light, the invisible part of the sun’s spectrum, penetrates the body rather than simply heating the air. The resulting increase in core body temperature stimulates detoxification, circulation and ant-inflammatory processes. There are three types of infrared heat. All infrared rays show a wide range of benefits. Specific wavelengths, however, seem to be more effective for certain therapeutic intentions. Most infrared saunas, including the model I have, use far infrared light. The newest model from Sunlighten, the mPulse, (which I would get, if I didn’t have my prior model) combines all three types of infrared for the most therapeutic, full-spectrum results. 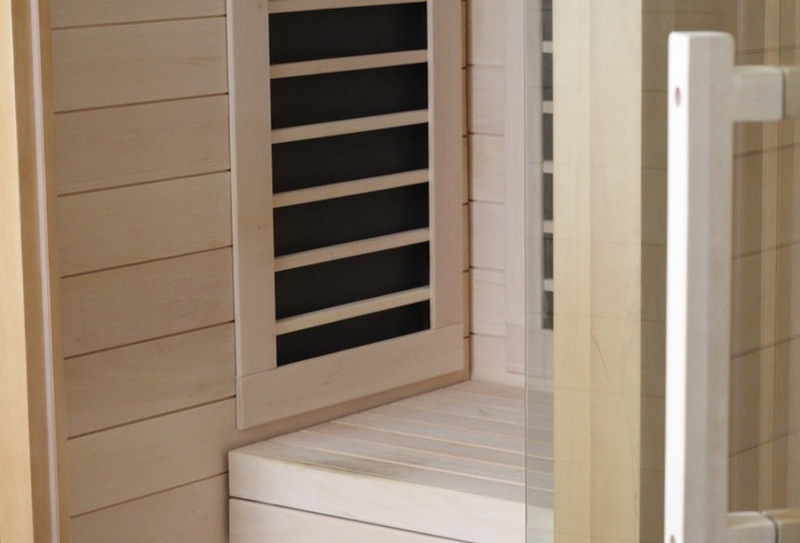 It is the only sauna with three separate heating elements in order to truly provide full spectrum infrared. When you increase your core body temperature, you increase your metabolism. As someone with low thyroid function, which slows the metabolism, I tend to be chilled and experience cold hands and feet. One way I support my thyroid function is with regular sauna sessions. An infrared sauna session raises your body temperature 2-3 degrees, depending on the quality of the infrared heat. (The Sunlighten sauna uses the only heater on the market clinically proven to raise body temperature nearly 3 degrees). Sunlighten saunas are clinically shown to support weight loss in a 3-month period, which makes sense considering that you can burn up to 600 calories in a single session. The cardio and metabolic benefits of a session are comparable are to a 6 to 9 mile run. 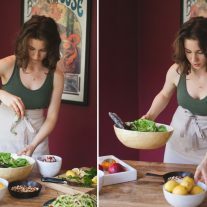 Although I eat a low-glycemic, nutrient-rich diet, I had consistently high blood sugar readings in the morning (I regularly use a glucometer, which I discuss here). I knew I couldn’t get to a deeper state of healing with this high blood sugar, as it impairs tissue regeneration and hormone balance. Working with a skilled practitioner, we implemented heavy-duty supplemental support but still my fasting blood sugar remained too high. We currently lack scientific studies that supports infrared saunas to improve glucose levels and insulin sensitivity. These results are a logical conclusion, however. Because saunas increase metabolic rate, it causes the body to burn blood sugar as you would burn energy during exercise. Hyperthermic conditions in animal testing has shown increased insulin sensitivity and lowered blood sugar (source). Four months after I began taking regular saunas, without changing my diet or exercise, my high morning blood normalized. On my last blood test, my insulin levels were no longer considered high. I credit my sauna for supporting my blood sugar when it didn’t adequately respond to diet, lifestyle, and supplements. Below, you can tour my Wellness Room where briefly discuss my sauna (skip to 2:30 to watch about the sauna). The practice of using sweat therapy for physical wellness dates over 4,000 years ago when American Indians began using sweat lodges. Did you know that hypothyroidism and candida overgrowth go hand-in-hand? As I’ve peeled back layers for deeper healing, I’ve found this to be a vicious cycle in my health. Hypothyroidism slows metabolism, which lowers body temperature. Candida and other pathogens abhor heat, so they are likely to overgrow in a person with low body temperature. Daily sauna therapy increases body temperature during the sauna session and overtime supports a balanced, healthy thyroid. This will help reduce a chronic candida situation. Additionally, the near infrared light may be effective in directly killing candida and parasites according to Wendy Meyer. This is a reasonable conclusion, although I haven’t seen any studies done on near infrared light and parasites. Additionally, due to increased blood flow to muscles, stretching in a sauna has been shown to increase flexibility by threefold. My Signature I is too small for full-body stretching, so I stretch after my sauna session. I take yoga and ballet classes most days, and so I’m always working toward increased extension in my back and legs. My regular sauna sessions made a noticeable difference in my flexibility after only one month. Although my Signature version uses only far-infrared light, I credit my regular sauna sessions for drastically improved skin clarity. My back acne and back acne scarring disappeared about 3 months after I began doing regular sauna sessions. Although I wrote the book on clearing acne with nutrition, I still experienced some occasional breakouts on my back. Sauna treatments were the missing piece in my complete acne healing. Infrared sauna therapy not only improves blood pressure, it can dramatically support heart health. A 2008 Japanese study concluded that far-infrared sauna therapy improves cardiac function and decreases cardiac size in chronic heart failure patients (Source). In the 1930’s, a dentist name Weston Price traveled the world to discover the secrets of the most beautiful and healthy people. 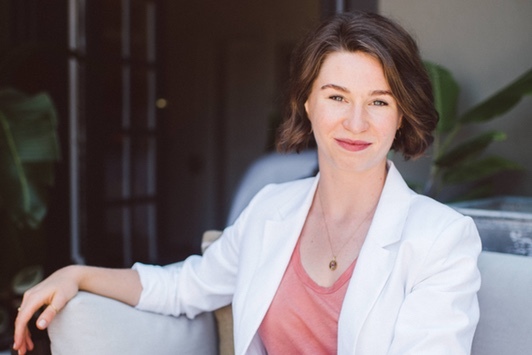 Dr. Price discovered that people thrived if they consumed their tribal diets, while those consuming a Westernized diet of refined foods suffered disease. Dr. Price wrote a book outlining the dietary rules that were parallel in every ancient culture, from the Eskimos to the Maori. His book has profoundly influenced my own healing journey, and led to a movement of “ancestral eating.” But diet only partly explains the vibrant health of non-Westernized tribal cultures. Like Dr. Price, we can look for ancient patterns that appear in cultures across the globe. One pattern is heat therapy. North America – Native American honor sweat lodges as a sacred place to purify the physical and spiritual self. Finland – Finnish sauna therapy dates back 2000 years, when Finns would dig pits in the earth and add enough hot rocks to create sweat-inducing heat. Ancient Greece and Rome – Bath houses featured a series of steam chambers, hot baths, and cold baths. Central America – Archaeologists believe they’ve discovered buildings that were ancient Mayan saunas. India – The ancient Ayurvedic cleansing ritual called Panchakarma uses a sweat-inducing steam treatment. Extremely low-EMF. Many far infrared saunas create notoriously high levels of harmful electromagnetic frequencies.EMFs impair the body from engaging in detoxification and rejuvenation processes. Safest materials on the market, to prevent chemical offgassing. Streamlined, beautiful, and intuitive to use. Sunlighten is to saunas as Apple is to computers. What sauna is best for me? The Signature Series (pictured above) uses far-infrared light. I have the Signature I, the smallest size, which fits in the corner of my office. The newest version, the mPulse Series (pictured below) combines all three types of infrared wavelength for the maximum therapeutic benefits. 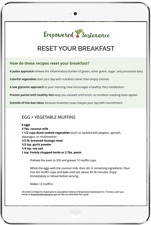 It offers preset programs with targeted combinations of the wavelengths for your health goals. The SoloPad is the smallest, portable far-infrared sauna. Ensure that your infrared sauna is low-EMF. This is the primary reason why I use a Sunlighten. Re-hydrate and re-mineralize your body after a sauna session. I suggest filtered water with a pinch of sea salt. Light-headedness after an infrared sauna may indicate low blood sugar (you may need to eat something). Shorten your next sauna session to find what your body tolerates. The sauna has an automatic shut-off, but don’t fall asleep in it. Preheat if desired (I preheat for 30 minutes). Relax and sweat away, for 20-60 minutes. Stay hydrated. Shower after, to wash off the toxic sweat. 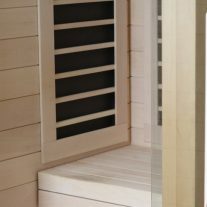 Visit Sunlighten.com to browse sauna models. Then click “Get Pricing” to immediately view the price sheet. Call to place your order and mention my name to get $100 off. The sauna arrives disassembled, to fit through a door. Two people are required for assembly. I hired a handyman to set mine up, and it took about an hour. Enjoy infrared sauna therapy in your own home! In our culture, it is often more acceptable to splurge on entertainment, clothes, and cars rather than our health. But I always prioritize investments in my health. For example, I do not purchase a cable subscription or Netflix subscription. I avoid that expense of about $1,000 per year. So I used the $2,000 I could have spent on media in two years and instead invested in a resource which has exponentially supported my healing. My infrared sauna is valuable investment in my health. As a result, I consider it an investment in my happiness, livelihood, and my wellbeing. Have you considered an infrared sauna? 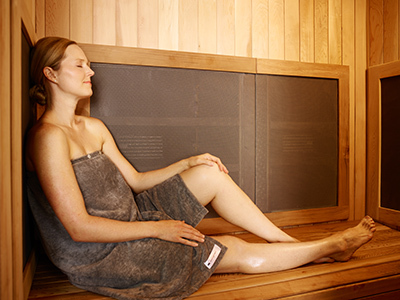 Have you used a sauna for any of the therapeutic benefits discussed? Which type of infrared did your friend use? I ask because I have thyroid problems. I just heard of infrared sauna and would really love to invest too. I don’t know if it’s really worth a try because I haven’t read reviews on this product yet. If I can see positive feedbacks of this product and its amazing benefits then I will try. I would love to know what you did to make your own. Thanks! Great insights… Just FYI, if you want to try before you buy or don’t have the space or $$$ to invest, almost all Planet Beach locations have a Sunlighten! There are over 200 stores globally and helpful consultants to go along with it. I currently have access to a sauna at my gym. Is there a way of knowing if it is infrared or EMF safe?? It is a YMCA, not an upscale facility. Great recommendations! Would you happen to have checked your Signature model with an emf meter? I know you say it’s low emf from Sunlighten themselves, but I’m looking for someone who has personally tested theirs. Very informative , I think I would pick the sauna.